Aida Miller and Jan Gaines have jointly donated a defibrillator to the synagogue, in loving memory of their mothers, z”l. On Monday 26th December, congregants who expressed interested in learning how to use the defibrillator watched a demonstration, which has been summarized below by Marsha Stein. 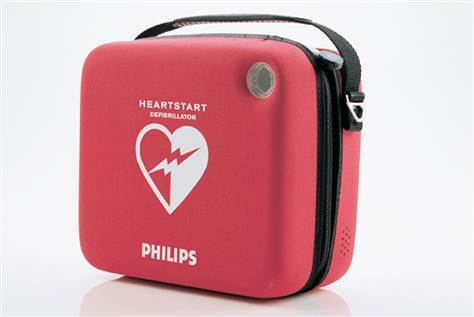 A defibrillator is a portable piece of equipment that can save lives by restarting the heart. An Automated External Defibrillator (AED) is simple to use. It gives voice prompts to advise the operator what action to take and tells them how to resuscitate a person who has suffered a cardiac arrest. The defibrillator is located opposite the sanctuary in a locked clear plastic box on the wall between the coat room and the ladies rest room. Some congregants will have copies of the key. A list of authorized people will be posted next to the defibrillator. When should the defibrillator be used? If a person collapses and is not breathing, it may be necessary to use the defibrillator to regulate his/her heartbeat. If in doubt, try using the machine anyway as it analyzes what the patient needs and will not deliver a shock if this is not warranted. 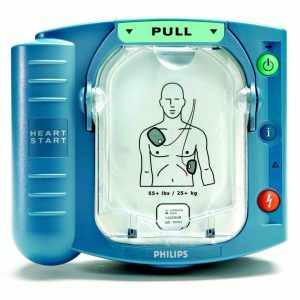 What are the steps to take before using the defibrillator? (1) Have someone call for an ambulance: 101 in Israel. (2) Lay the ill person down and check his/her breathing. If the person is breathing, that means he/she has a pulse, and therefore there is no need for using the defibrillator. (3) Begin CPR chest compressions while someone else goes to retrieve the defibrillator and set it up. (4) Remove the person’s clothing covering the chest, cutting away the fabric if needed. There are scissors in the defibrillator case. (5) Pull off the defibrillator plastic cover where it says “Pull.” (See the picture above). Place the electrodes directly on the skin as shown on the plastic pads: one on the right side just below the collar bone at the shoulder, and the other on the left side just below the breast on the side of the ribs. Using the two electrodes completes the electrical circuit needed to shock the patient. (6) Move AWAY from the patient and have everyone in the room stand clear. (7) Press the orange button (red in the picture above). The machine will analyze whether or not the patient needs a shock. The shock takes about one second and the patient will move in response to being shocked. (8) When the shock is over, press the blue button, which is for information. The machine will tell you in Hebrew what to do. Note that the machine makes all the decisions AND tells you what to do; the only decision you need to make is to break the seal and apply the patches. (9) Begin CPR chest compressions at the rate of the metronomic sound emitted from the defibrillator. Do this by placing one of your hands over the other, fingers raised, and pressing about 2 inches or 5 centimeters deep over the center of the person’s chest between his/her breasts. (A course on CPR will be offered in the near future: ask Sara about this). (10) Leave the electrodes attached to the patient. The machine will tell you if another shock is necessary. (11) Continue CPR until the ambulance arrives and medical professionals take over. If you tire, ask another person trained in CPR to take over the chest compressions. There Is no need for non-medical professionals to check a patient’s pulse. If the person is breathing, he/she has a pulse. If he/she has a pulse, defibrillation is not needed. 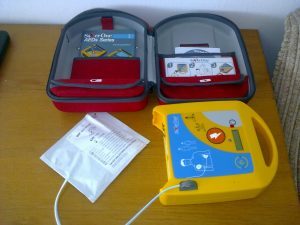 The defibrillator is designed to be used by non-medical professionals before a patient reaches a hospital. Do not fear its use. The defibrillator is a “smart” machine; it analyzes what the patient needs and will not administer a shock to someone who doesn’t require it. The machine makes all the decisions AND tells you what to do. It also knows how to take pacemakers into account when deciding whether or not a shock is appropriate. If you inadvertently reverse the right and left electrodes, the defibrillator will reverse the currents so that it will still work. The defibrillator will not start while someone is doing CPR on the patient; CPR must be stopped before pressing the button to start the machine. The defibrillator is ready to work and needs no electricity nor charge of its battery. The battery will last 5 years or for 200 shocks.